This article is first installment of a series I am calling “Prophecy Fundamentals” in which we will cover some of the prophecies that are fundamental to the understanding of current events and their part in Bible prophecy. This installment will cover the vision given to the prophet Daniel while Israel was in exile under Babylonian captivity and show its connection the beast depicted in Revelation 13. We will then look at the United States’ role in end time events. In Daniel 7, we see that Daniel has a dream. In his dream, he sees four beasts: a lion with eagle’s wings, a bear, a leopard with four heads and the wings of a fowl, and a fourth beast more ferocious than the rest. In this section, we will discuss the first three beasts. Before we can understand the meaning on this dream, we need to understand what these beasts represent. Luckily, we do not have to look far! Just a few verses down in Daniel 7:17, we are informed that these beasts represent nations that were not currently on the earth, but will be on the earth at a later date. Reading on, you can see that these are nations that will be on the earth in the end times because it talks about the establishment of God’s Kingdom on Earth around the same time. In Daniel 12:4-9, we see that the scroll and the meaning is “sealed up” until “the time of the end”. This is very important because it is telling the reader that the prophecies of the book of Daniel will not be fully understood until the time immediately preceding Jesus return. 4 But you, Daniel, roll up and seal the words of the scroll until the time of the end. Many will go here and there to increase knowledge.” 5 Then I, Daniel, looked, and there before me stood two others, one on this bank of the river and one on the opposite bank. 6 One of them said to the man clothed in linen, who was above the waters of the river, “How long will it be before these astonishing things are fulfilled?” 7 The man clothed in linen, who was above the waters of the river, lifted his right hand and his left hand toward heaven, and I heard him swear by him who lives forever, saying, “It will be for a time, times and half a time. When the power of the holy people has been finally broken, all these things will be completed.” 8 I heard, but I did not understand. So I asked, “My lord, what will the outcome of all this be?” 9 He replied, “Go your way, Daniel, because the words are rolled up and sealed until the time of the end. Now we know four important facts to assist us in deciphering Daniel’s dream. They are not nations that were on earth at the time the dream was given to Daniel since Daniel 7:17 says that the nations will arise. Also in Daniel 7:12 we see that the nations in question remain in power for a short time after Jesus establishes his kingdom on Earth. The nations such as Babylon that were in power in that time have long since disappeared. The nations will be on the earth immediately preceding Jesus return to the earth. These prophecies will not be understood until the end times immediately before Jesus’ return. Armed with this knowledge, is there any way we know what nations they represent? Yes. There are a number of clues given in this vision to identify these nations. The first and most obvious clues are the beasts themselves. Since we know that the beasts represent nations, and we know that it is common today to associate animal symbols with nations, are there nations on earth today that are represented by the beasts in Daniel’s vision? Yes. Let’s start with the first beast: the lion with eagle’s wings. In Daniel 7:4 we see the wings being plucked off of the lion and becoming its own being. Everyone knows that the eagle is the symbol of the United States, and many people will also recognize the lion as the symbol of the United Kingdom 1. On July 4th, 1776, the United States signed the Declaration of Independence declaring the United States of America as its own sovereign country independent from the UK. This declaration was signed soon after the start of the Revolutionary War where America chose to fight for its independence. It is interesting to note that our independence day is July 4th (7/4) and the wings were broken off of the lion in verse 7:4. In Other words, the wings of the eagle (America) were broken off the Lion (the UK) when America became a country on July 4th, 1776. I believe Daniel 7:4 was a prophecy of the Declaration of Independence – the birth of America. I find the imagery regarding the lion quite interesting. The wings were part of the lion and in Daniel’s dream, they are being torn off. This paints a picture of a painful removal of the wings from the lion. The UK wanted to retain control of America, and they were willing to go to war to ensure that happened. This demonstrates that the removal of America from its control was not consensual. Ultimately, America’s independence was earned through war, and the deaths of tens of thousands of people. Let’s move on to the bear. If you pay any attention at all to the news, it is very easy to identify the Bear as Russia. You hear the talk regularly about the Russian Bear 2. Russia is well known for its ability to devour much flesh as leaders like Lenin and Stalin killed several million people. This leaves us with the leopard with four heads with the wings of the fowl. Most people probably do not know that the symbol of France is a Rooster 3, which is a fowl, and the unofficial symbol of Germany is the leopard 4. 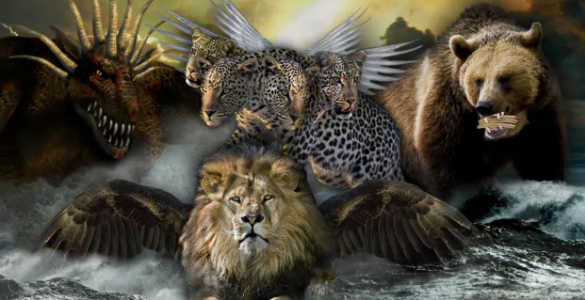 If the leopard represents Germany, and the wings of the fowl represent France, why are the wings on the leopard and why does the leopard have four heads? On January 22, 1963, France and Germany signed the Élysée Treaty ending centuries of rivalry between them. In fact, their allegiance is so strong that they are often described as the “core countries” or the “twin engine” in the EU. 5 This imagery from Daniel’s vision highlights the very close relationship between the two countries. As for the four heads, Germany has had three reichs, with Hitler’s third reich likely being the most well-known albeit infamously. However, there are a growing number of people acknowledging the existence of Germany’s fourth reich today! 6 It is common to see talk to Germany dominating the EU, and in Daniel 7:6 we see that dominion was given to the leopard. The clues from Daniel’s vision fit perfectly with the most powerful nations on earth today! Now let’s take a brief look at the United Nations Security Council (UNSC). The UNSC is comprised of five permanent members (each of whom have veto power), and ten rotating members who each serve for two years. The five permanent member nations that have veto power include the following: the United States, the UK, Russia, France and China. When a resolution comes up for a vote in the UNSC, if any of the five permanent members veto the resolution, it fails. In other words, fourteen members could vote for a resolution and a single permanent member could veto a resolution and it would fail. This makes the five permanent members the most powerful nations in the United Nations because they have such great power in determining world governing policies. So out of the five permanent members in the UNSC, four of them are represented by the vision in Daniel 7. This is too much to be coincidence. In fact, it demonstrates just how precise Bible prophecy really is! The United Nations is structured to be a world governing body, with the nations each being a member country. They create global governing policies by voting much like a democracy. They have the power to sanction countries that violate UNSC resolutions, and bring people before the International Criminal Court (ICC) for violating international law, and much more. This world-governing body was prophesied in the Revelation 13 in a vision given to John. Armed with the understanding of Daniel 7, we are able to see the United Nations in scripture crystal clearly. Here we see the same symbols from Daniel 7: the leopard, the bear and the lion. But rather than them being distinct beasts, they are now united into a single beast with different parts of each of the beasts. The body was like the leopard, the feet were of the bear, and the mouth was of the lion. Since we know that the beasts represent nations, and now we see them united into a single beast, it would be appropriate to call this beast from revelation the “United Nations”. It is important to note that the wings of the eagle are missing from this united beast. Instead, we see the wings of the eagle in Revelation 12:14 protecting Israel. 9 And the great dragon was cast out, that old serpent, called the Devil, and Satan, which deceiveth the whole world: he was cast out into the earth, and his angels were cast out with him. This shows us that the dragon is the devil, Satan. He will give his power and authority to this combo-beast, the United Nations. As we can see, Daniel’s dream shows us the nations that would be on earth just before the return of Jesus to this earth to setup His kingdom. He told Daniel that the book was sealed until the time of the end. This makes sense because there is no way Daniel could have understood the prophecies at that time since the nations the beasts represent did not exist at that time. But because God wants his people to understand the prophecies, he used symbols that we would recognize when the time was right. Now that all of these nations are on earth, we can understand clearly much of the symbolism of these prophecies, and when the symbols are understood, they reveal much about events to come. When we seek him, God will reveal himself to us through his word.